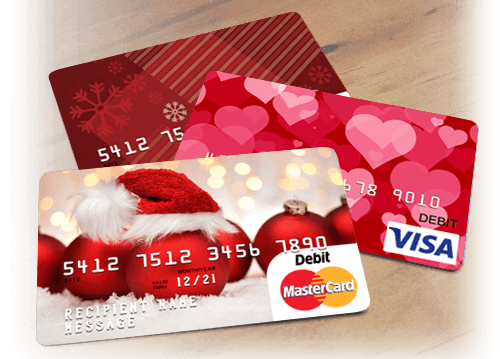 Mastercard® and Visa® gift cards make a great holiday gift. We have over 3,000 seasonally-themed gift cards to choose from, covering nearly every holiday from Christmas and Hanukkah to Valentine's and Teacher’s Day. Each card can be personalized with two lines of text on the card and you can set any amount from $20.00 up to $500 per card. To make your gift more memorable, you can add a custom greeting card to go along with the card. “How many times do you write out a gift list and spend hours shopping for the perfect present–only to end up buying a gift card anyway? Spare yourself the hassle. Make a gift card list and savor the gifting instead."